What will a day in the life be like when the cloud becomes even more ubiquitous than it is today? The very term "cloud" refers to any computing resource not in your current building. There is cloud storage, computing, and various applications ranging from the success of Salesforce online apps to the map you used on your phone (or watch) this morning. 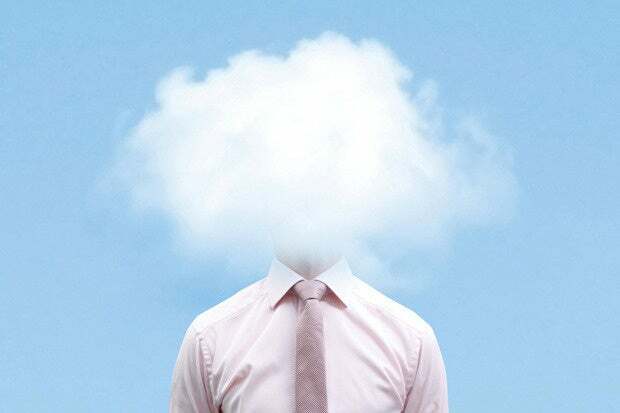 The Internet is now synonymous with the The Cloud. Let's dream about the cloud a little bit. Your body token was read by an RFID scanner as you walked in the door to the (train station, airport, building complex entrance) where it authorized you to go inside, noted you have $20 to spend on food in the (canteen, restaurant, company cafeteria), and that you can use the (company self-driving car, network terminals, network itself to Grade 51, doors to all red/green/black restrooms with unlimited toilet paper) and are permitted to exit any door. Auto-lighting turns on as you arrive, as 19 browser windows open, including the sensors to the bodywear links, which will link to your HMO. Queueing up in the background is your self-driving car that'll take you to your 11:00 meeting. Your RFID will let the restaurant know you prefer lightly salted, gluten-free, non-GMO foods with no chicken. But here in your home away from home, the music and lighting mood have started and you're browsing your usual haunts, dealing with analyzed emails, including archiving all of the CC:s you've received. Last week's paycheck, along with automatic tax filings with weekly refunds, are already done, and this week's bills are finished. News of the Saudi-Israeli Alliance, now scheming against the New Crimea-Hungarian extremists, have re-routed your travel schedule on the London-Shanghai MagLev train, now going under the Mediterranean via peaceful Damascus. Drones deliver your coffee, flashing the receipt to your phone. Your shoes set off a wear alarm, and several browser popups ask for your approval for replacements, including the all-important anti-gravity heal protectors and heavy-duty mileage indicators. You click, and soon you hear yet another drone passing by, which will wait for you to change your shoes, then take the old ones for fumigation and recycling. A gentle tapping, discretely on your shoulder, allows your reminder monitor to motivate you to leave for the meeting. Lights go out and music shuts down as your life is downloaded to your phone and backed up into the cloud. The car awaits, along with four colleagues, the table already lit with browser selections and as-you-go tour tally as the windows become not-quite opaque. You barely feel any motion as you're whisked 30 miles through dense traffic to the meeting at the restaurant. Your car queues to a stop at the entrance and parks itself as you go in. A drone waiter brings recycled water with ice and awaits your order. Someone shuts off the meeting monitor so a joke can be told, then turns it back on. The monitor is quizzical as why everyone's laughing. You mute the monitor and continue. Everyone's blood alcohol percentage is taken by another drone, to clear you for return to work. The bill paid, the car queues at the door and soon everyone is delivered to their afternoon destination. Soon it will be dinner time. The technology sector's one percenters may have an interesting future. How much of this trickles down to the rest of the world is unknown. Perhaps it's another Digital Divide to consider.